Researchers from the University of Illinois at Urbana-Champaign, the Georgia Institute of Technology and the University of Tokyo have developed a new "zippered tube" configuration that makes paper structures that are stiff enough to hold weight yet can fold flat for easy shipping and storage. Their method could be applied to other thin materials, such as plastic or metal, to transform structures from furniture to buildings to microscopic robots. Illinois graduate researcher Evgueni Filipov, Georgia Tech professor Glaucio Paulino and University of Tokyo professor Tomohiro Tachi published their work in the Proceedings of the National Academy of Sciences. 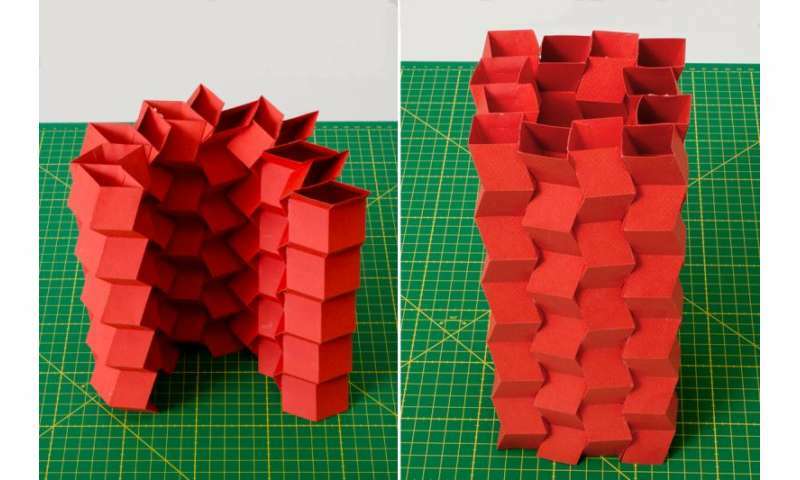 Origami structures would be useful in many engineering and everyday applications, such as a robotic arm that could reach out and scrunch up, a construction crane that could fold to pick up or deliver a load, or pop-up furniture. Paulino sees particular potential for quick-assembling emergency shelters, bridges and other infrastructure in the wake of a natural disaster. 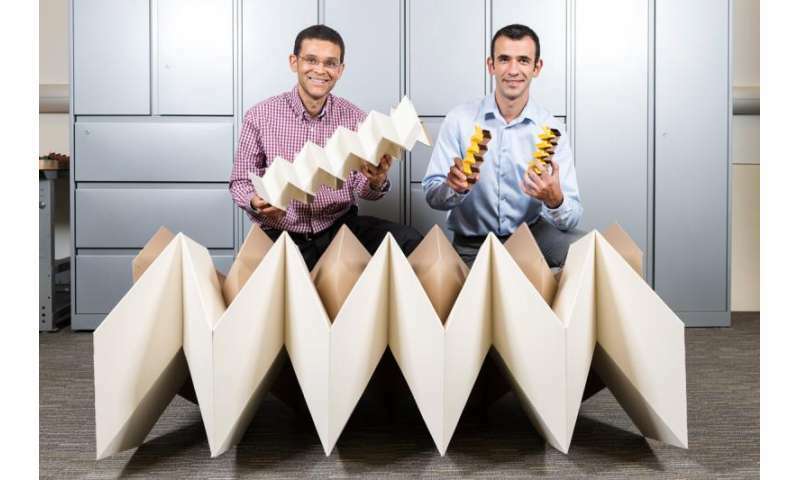 "Origami became more of an objective for engineering and a science just in the last five years or so," Filipov said. "A lot of it was driven by space exploration, to be able to launch structures compactly and deploy them in space. But we're starting to see how it has potential for a lot of different fields of engineering. You could prefabricate something in a factory, ship it compactly and deploy it on site." The researchers use a particular origami technique called Miura-ori folding. They make precise, zigzag-folded strips of paper, then glue two strips together to make a tube. While the single strip of paper is highly flexible, the tube is stiffer and does not fold in as many directions. "The geometry really plays a role," said Paulino, a former Illinois professor of civil and environmental engineering. "We are putting two tubes together in a strange way. What we want is a structure that is flexible and stiff at the same time. This is just paper, but it has tremendous stiffness." The zipper configuration works even with tubes that have different angles of folding. By combining tubes with different geometries, the researchers can make many different three-dimensional structures, such as a bridge, a canopy or a tower. 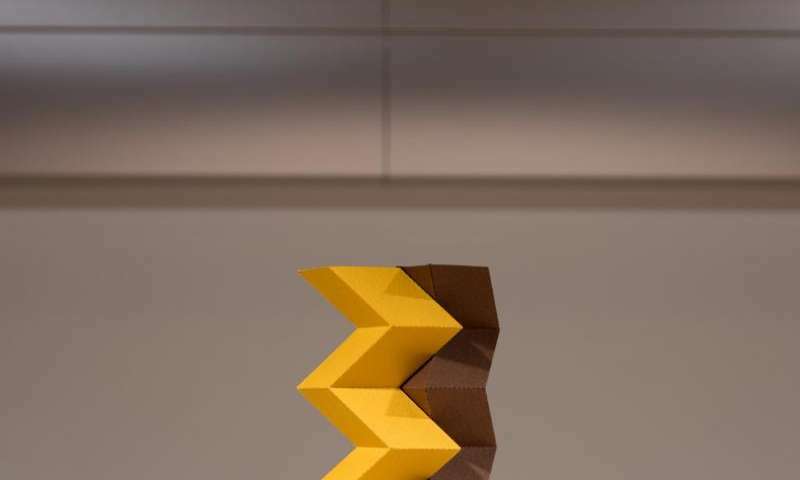 "The ability to change functionality in real time is a real advantage in origami," Filipov said. "By having these transformable structures, you can change their functionality and make them adaptable. They are reconfigurable. You can change the material characteristics: You can make them stiffer or softer depending on the intended use." The team uses paper prototypes to demonstrate how a thin, flexible sheet can be folded into functional structures, but their techniques could be applied to other thin materials, Filipov said. Larger-scale applications could combine metal or plastic panels with hinges. "All of these ideas apply from the nanoscale and microscale up to large scales and even structures that NASA would deploy into space," Paulino said. "Depending on your interest, the applications are endless. We have just scratched the surface. Once you have a powerful concept, which we think the zipper coupling is, you can explore applications in many different areas."